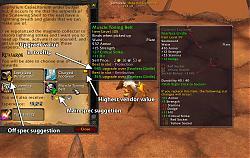 Dugi Questing Essential is an All-In-One addon for anything to do with questing & leveling. Every option in the list below can be disable easily from the config menu. Type /dugi for a list of commands. New GPS style "Search Location" feature. You can use this to search for locations in WoW by name and get a result of clickable waypoint for the location name. NEW TomTom Emulation - This will allow you to use Dugi with other TomTom compatible addons like Lightheaded and make use of the /way commands without using TomTom addon. - Works automatically no setup required. - Weight Stats used for calculation is the same as AskMrRobot to ensure the best gear suggestion. - Green Arrow will also appear during loot roll, dungeon journal, vendors. - Customizable Hit and Expertise cap. Watch Frame Border - A set of cool borders available for the Watch Frame (Objective Tracker), the border will also play a *flash* animation when you complete a quest. Quest Complete Sound - Play a sound whenever you complete a quest, a set of voice sound available for all races and genders. Map Preview - A slick Minimap will fade in and fade out showing your the quest location. This will work automatically when you interact with the quest POI on your Objective Tracker. Waypoint System with Taxi Feature - Works similar to TomTom, clicking the Quest POI in your Objective Tracker will automatically place a waypoint for the quest. The waypoint arrow will turn green if you enter the selected quest area. You can also create your waypoint by CTRL + Right Click on your map and you can also link them together by holding SHIFT + Right Click on your map. Map Coordinates - Your standard map coordinates system which will appear at the bottom of your World Map and Minimized Map. Remove Map Fog - Reveal all unexplored area, but you can still tell which area is unexplored from the slight dark overlay, similar to Mapster. Auto Quest Accept - Lightning fast quest accept and turn in, hold Shift while talking to a NPC to temporarily disable it. Auto Sell Grey Items - Sell all the junk that you picked up while questing automatically and display the total profit. Auto Quest Item Loot - Loot quest item automatically without picking up other junks. Floating Quest Item Button - Don't you hate clicking the quest item on the Objective Tracker because its in an awkward position? The floating quest item can be moved anywhere on your screen and the button will appear if a quest item is available when you click on the Quest POI in Objective Tracker. 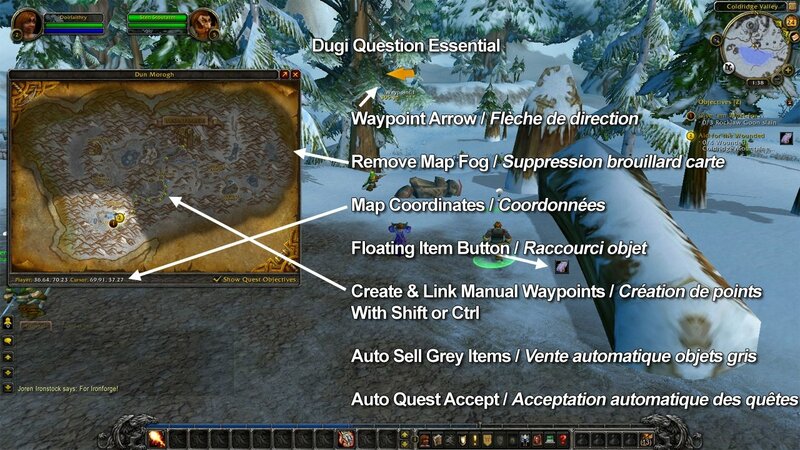 Dugi Questing Essential est un addon «*tout en un*» dédié au leveling et aux quêtes. Cliquez droit sur l’icône Dugi pour accéder aux options. Chacune des options suivantes peut être désactivée à partir du menu réglages. Carte fantôme – Une carte apparaît en transparence montrant la localisation de l’objectif de quête. Fonctionne automatiquement en sélectionnant une quête dans la fenêtre de suivi des objectifs Blizzard. Coordonnées – système permettant de définir les coordonnées de points dans le jeu. Elles apparaissent sur la carte et sur la minimap. Suppression brouillard de carte – Révèle les zones non explorée qui restent identifiables par la présence d’un voile sombre. Dans le même esprit que l’addon Mapster. Acceptation automatique – Acceptez et rendez les quêtes à la vitesse de l’éclair en faisant un simple clic droit sur les PNJ. Pour désactiver momentanément cette fonctionnalité, maintenez la touche SHIFT enfoncée quand vous faites un clic droit sur le PNJ. Vente automatique des objets gris - Vend automatiquement tous les objets sans valeur (gris) que vous récoltez au fur et à mesure des quêtes. Il suffit de parler à un PNJ marchand. Raccourci objet – Quand une quête nécessite l’utilisation d’un objet, une icône apparaît et il suffit de cliquer dessus pour l’utiliser. Cette icône est positionnable n’importe où sur l’écran et n’apparaît que si l’objet est disponible. * Fixed scrolling in Current Guide view tab so it doesn't scroll down pass the last step. * New Search Quests feature, the search bar now has an option to search quest names in the guides. * Memory usage optimization. Now memory usage is much more constant incase nothing is happening in the game. * Fixed "Move Objective Tracker" to remember position after a reload in Essential mode. * Rebuild Objective Tracker border feature to prevent taint Lua error and breaking the objective tracker. * Improved automatic waypoint detection to stop switching to the nearest quest after PLAYER_ENTERING_WORLD event. * Fix Map Ants bug to prevent it from connecting waypoints sometime. 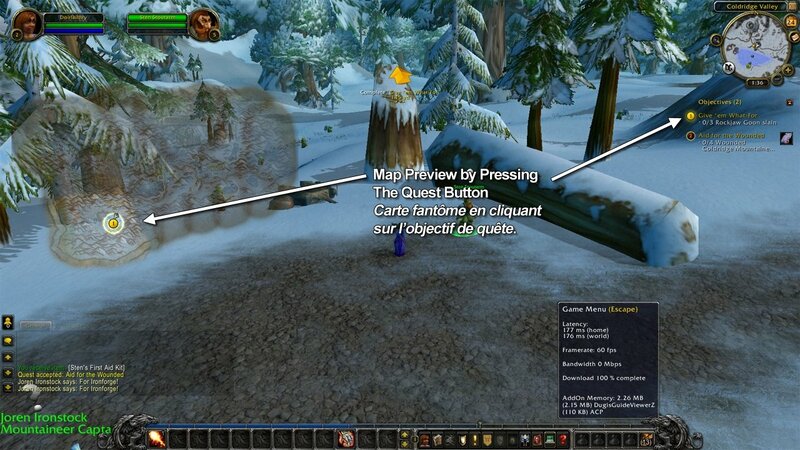 * Adjust Map Preview ping animation position to be more accurate. * Fixed gear advisor for Paladin Retribution spec. * Fixed gear advisor for Rogue weapons Dual Wield priorities. * Fixed Map Fog bug for Mount Hyjal and Twilight Highlands. * Flight Master default setting changed to "Always"
* New GPS style "Search Location" feature. You can use this to search for locations in WoW by name and get a result of clickable waypoint for the location name. * Fixed waypoint arrow to not display after Pet Battle if the "Show Dugi Arrow" option is off. * Adjusted Abandon quest button position. * Added Stamina slot for all classes and specs for custom Gear Scoring. * Updated Gear Advisor stat weight for patch 6.2, clicking the "Reset Weights" button in Gear Scoring section is required for the new stat weight to take effect. 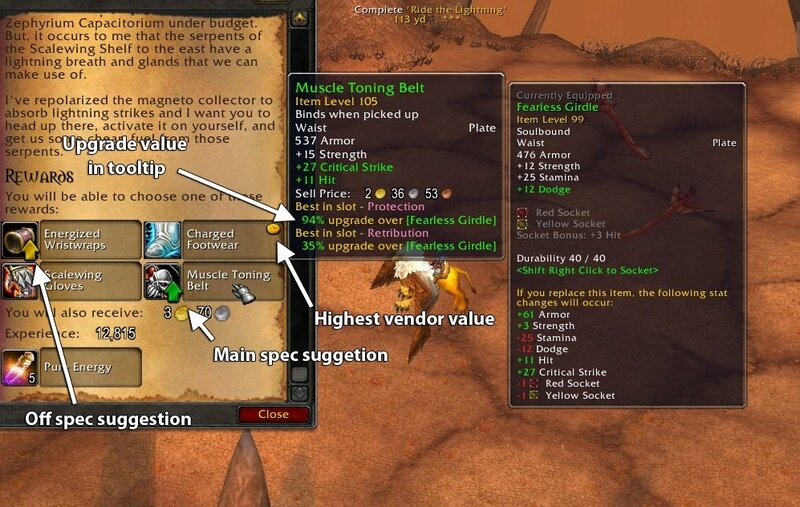 * Gear Advisor will now suggest trinkets again and it will also use the item level value for suggestions which should help a bit. * Optimized some codes to reduce CPU usage. * Fixed Objective Tracker bug, which moved the tracker while if vehicle, mount or repair indicator is active. * Updated flight master data for patch 6.2 for Tanaan Jungle. * Fixed Gear Advisor to score Spell Power stat value. * Fixed Corpse arrow setting from disabling itself. * Fixed missing waypoint arrow after using a teleport spell or loading screen. * New Weapon Preference option now available in the 'Gear Set' setting menus. This will allow you to choose fast vs slow weapon preference between main and off hand or disable it swapping completely. * Fix Waypoint Arrow with TomTom emulation to always point to the first waypoint and not the last. * Fixed Waypoint arrow to hide during pet battles. * Fixed spinning waypoint arrow issue with Carbonite, it should work a lot better now. * Reduced MapPreview spam. MapPreview will now only appear once per step or when you manually click a waypoint button or Quest POI. * Improved corpse waypoint arrow to point to corpse first if player is dead and improved reaction after resurrection. * Modified /dugi fix to also reset Frames Position. * Fixed more UseSpecialQuestLogItem() taints. * Fixed QuestPOIs without Blobframe not activating MapPreview. * Gear Advisor will no longer make suggestions for Trinkets because it is unable to calculate the value of the "Use" effects. 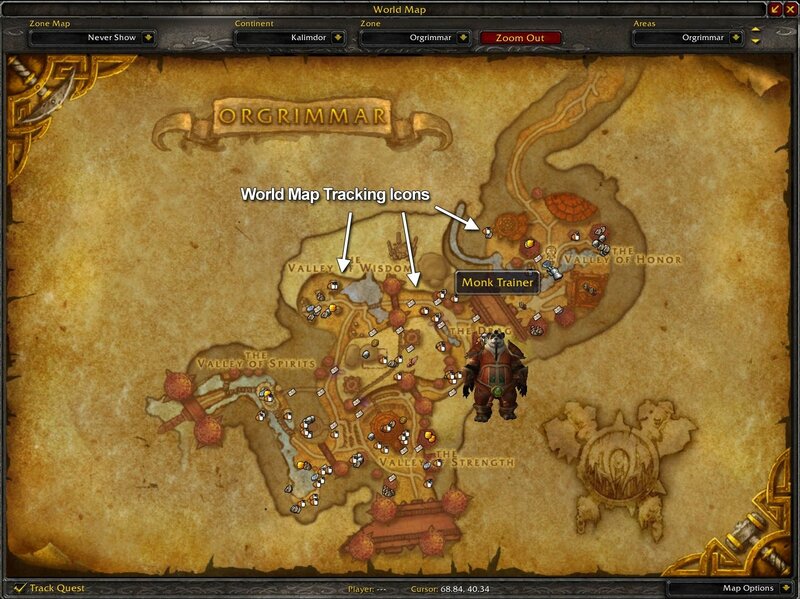 * Updated World Map Tracking for Draenor, Find nearest should display more NPCs now. * Fixed frame level in Gear Scoring section. * Updated Astrolabe data for different Garrisson tiers. * Target button now play an activation alert animation on show to help you find it. * Added 'Ignore Cooking Items' option for gear set. * Improved World Map Tracking to detect garrison level. * NEW Target button feature now available. 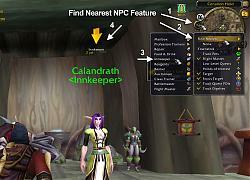 * Target button is available when you you click an NPC in World Map Tracking. * Improved Waypoint arrow performance to reduce CPU usage and fix possible taint. * Improved Map Preview to be less annoying. Stopped it from popping up during quest, vendor and flight master interactions. * Renamed "Ignore Fishing Pole" to "Ignore Fishing Items" , the option will now ignore all items with +fishing stat on it. * Use TomTom option is now enabled. * Updated TaxiData - removed mini dark portal and added Ashran portal from Capital cities. * Update WatchFrame.lua file which was missed from last build. * Rename setting option Ignore Fishing Pole to Ignore Fishing Items, it will now ignore all items with +fishing stat. * Updated Flightmaster database for Draenor. The red icon should appear now. * New Move Objective Traker option in Settings > Frames. This option is not available with incompatible UI addons. * Fixed waypoint arrow to remember scale settings. * Waypoint arrow is brighter when character is facing straight towards the waypoint. * New Ignore Fishing Pole option in Settings > Gear Set, default on. * Modified Gear Advisor prompt window to prevent confusions. - You can no longer click on the recommended and equiped items. - Ticking the Add to ban list check box will switch the selection. - Reset Ban List is now also available in the prompt window. * Fixed Taxi System to suggest flight masters, spells, hearthstone. * Carbonite support disabled for now until it has been updated. * Taxi System will now automatically add routes for different floors and entrance in Dungeons and Micro dungeons. * Fixed TomTom emulation feature, should work with RareCoordinator and other addons. * World Map Quest Tracking NPCs icons is now clickable to set a waypoint and also display the Model for the NPC in a tooltip. * Gear Advisor is currently disabled until a full update is complete. * Move Watch Frame options is currently not available. * Fixed Gear Advisor bug that ignored heirlooms after the player level is higher than the heirloom scaling limit. * Prevent waypoint arrow from showing if there is no waypoints on the map. * Fixed taxi not suggesting "Teleport: Dalaran" spell for Horde Mages. * Fixed over 100 inns locations with World Map Tracking, Taxi should suggest using the Hearthstone a lot with inns that didn't work before. * Fixed Gear Advisor issue with not scoring amulets, rings, trinkets for all Hunter spec. * New TomTom Emulation option - this will allow you to use Dugi with other TomTom compatible addons like Lightheaded and make use of the /way commands without using TomTom. 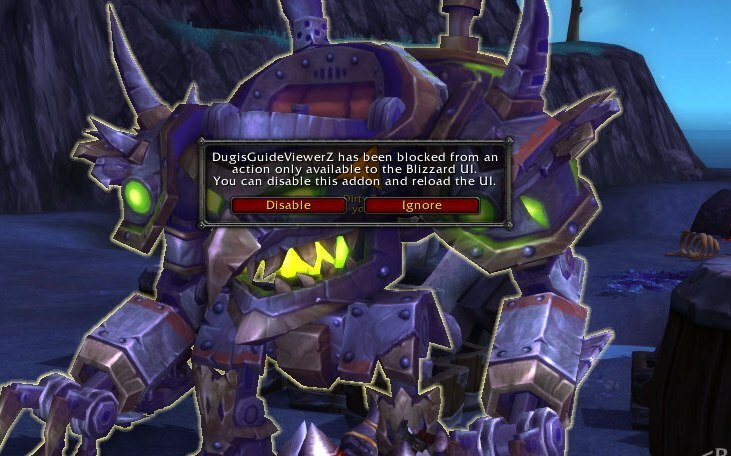 * New Manual Waypoint option, you can use it to disable Dugi's Manual waypoint if it conflict with another addon. * Fixed Gear Advisor issue that ignored item if it's classed as INVTYPE_ROBE for Cloth and Leather chest armors. * Fixed typo in TOC, IsDisabledByParentalControls taint fix should work now. * Fixed gear advisor error while when viewing equipment manager during combat. * Fixed error on waypoint recalculation of points. * Waypoint recalculation only renders if check is different with current waypoint list, this should reduce the map preview and waypoint spam. * Performance improvements in the face of CRITERIA_UPDATE and BAG_UPDATE spam during zone swap. * Fixed manual waypoint linking and appended route calculation. * Rebuilded Taxi Flightmaster data for Pandaria again. * New Asynchronous Taxi system. This prevent FPS loss during waypoint calculation but will take longer to complete, a loading icon will appear instead during calculation. * Set Timeless isle as ground mount only for Taxi. * Rebuilded Taxi Flightmaster data for Pandaria. 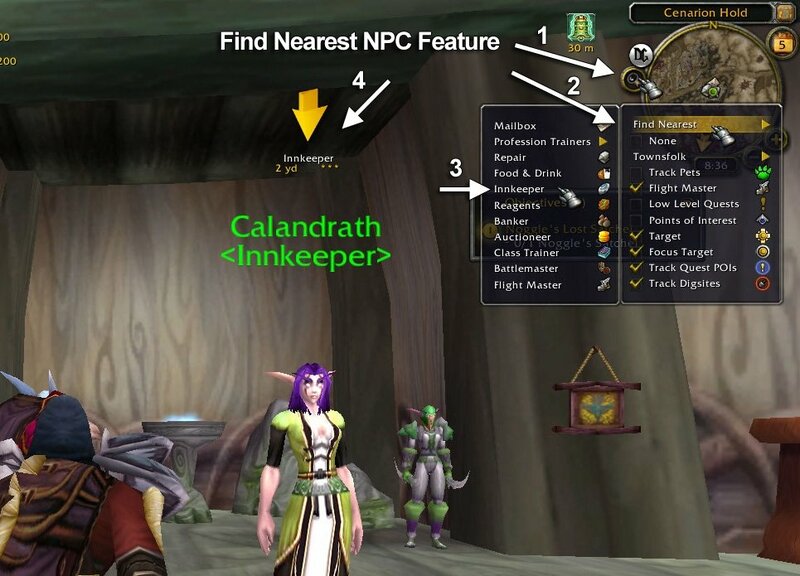 * Added "Hopswift" NPC as the mailbox for Timeless isle for World Map Tracking. * Fixed gear advisor error, with some chest item. * Fixed localization for "Turn in" waypoint arrow text. * Fixed gear advisor dual wield issue with frost Death Knight spec. 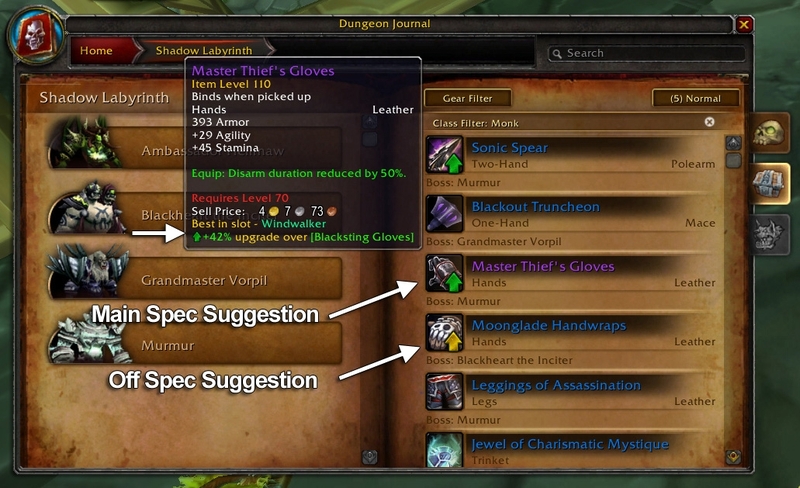 * Gear advisor PvP support are now available again in Gear Set > Smart Set options. * Fixed random gear advisor "compare nil" error. * Improved corpse arrow so that it will always be the first waypoint if player is dead and also include it as part of the taxi system. * Fixed missing taxi data for Horde 'Spirit of Gnomeregan' flight master in Sholazar Basin. * Added Taxi data for the teleport pad in Storm Peaks from K3 to Garm's Rise and back. * Re-sync Watch Frame after loading screen if 'Watch Frame Compatibility Mode' is enabled. * Improved gear advisor dual wield support. It should now make correct suggestion as to which weapon should be on main hand or off-hand depending on the character's class. * Fixed auto repair message spam. * Fixed gear advisor error with Frost Mages. * Fixed Taxi system bug with waypoints in Teldrassil. * Fixed Taxi system bug that could clear waypoints too early. * 'Move Watch Frame' option is no longer greyed out when 'Watch Frame Compatibility Mode' is enabled. * New Auto Repair feature (default off) available in Settings > Other. This will automatically repair your equipment when you interact with vendor that has a repair option. * Optimized gear scoring to decrease FPS loss. * Optimized gear advisor tooltip to decrease FPS loss. * Fixed taxi system bug to recalculate correctly upon receiving flight master data for the first time. * Typing '/dugi way' will now place a waypoint for the player's current location. * Fixed WatchFrame border bug that can increase the border to maximum size when turning addon on/off. * Map Preview setting slider now display the value of the slider. * Reduced overall addon load time. * Fixed bug that increased CPU usage with 'Auto Equip Smart Set' option enabled. * Fixed Gear Advisor suggestion delay. * Optimized several functions to greatly reduce the CPU usage. * Gear Advisor now works with vendor items. * Fixed Gear Advisor during loot roll. * Added on/off state to profile variables. * Fixed bug that prevented the manual equip set button and 'Dugi Smart Set' in equipment manager from working when 'Auto Equip Set' option is unticked. * Fixed error produced when no gear scoring option is selected. * Fixed Gear Advisor bug with Shaman and Mage. * Fixed minor lua error. * Fixed bug that will break the Watch Frame border when you turn the addon on/off while using some UI addons. * Gear Advisor is now available for the Dungeon Journal. * Added asynchronous operation to improve Gear Advisor performance. * Fixed bug with Gear Advisor that made it suggest an off hand item when character already have 2 hand weapon equiped. * WatchFrame height will no longer extend over the default limit when using WatchFrame Borders and/or Anchored Frame options. * Gear Scoring settings option is now available. * New setting option. Frames > "Watch Frame Compatibility Mode" (default on). Tick this option if there is a conflict with other addons that also modify the watch frame, a /reload maybe required to move the watch frame with other addons. * "Lock Watch Frame" has been named to "Move Watch Frame" (default off) , not available if "Watch Frame Compatibility Mode" is on. * Gear Advisor now works during loot roll situation. A red arrow will appear to indicate upgrade so you will know when to need or greed. * Updated Blasted Lands portal location for Orgrimmar. * Fixed bug with 'Automatic Quest Tracking' option. * New Gear Advisor Feature - See new screenshots for details , this is on by default you can turn it off from the settings menu. * Fixed MapPreview "Single Quest" setting bug. * Carbonite Arrow is on by default for Carbonite users. * Fixed bug that remove Watched Quest on Login, or Loading event. * Added Grimwing flightmaster data for Death Knights. * Updated German localization (thanks to Timur). * Fixed bug that changes Modern arrow switching back to Classic. * Adjusted Deeprun Tram data for Taxi System to priortize it over flightmaster to Ironforge. * Fixed Ant Trail bug that made it fail to connect different points. * Minor lua error fix. * Automatic Waypoints will no longer overwrite manual waypoints. * Automatic Waypoints feature will now work by selecting the closest QuestPOI to your character and updates automatically on QuestLog Update. * Fixed Map Preview LUA error again. * Use Carbonite Arrow is now available and will work on QuestPOI and world map tracking, but not for creating manual waypoints. * Remove 'Use Carbonite Arrow' until its fixed. * Improved Taxi calculation for low level players in Pandaria. * Improved Taxi hearth stone usage. * Fixed "Single Quest" and "Tracked Quest" settings in map preview. * Added Vale of Eternal blossom teleport spell Taxi data. * Updated 5.1 Flightmaster Taxi Data. * Added Pandaren Voices for quest completion. * Show Objectives option in WorldMap is disabled during combat to prevent taint issue. * Fixed issue that cause the QuestPOI button to disappear in the Objective Tracker. * Auto Quest Accept feature won't auto accept or turn in quest from Fiona's Cavaran, Khadgar, Nam Ironpaw. * Missing SavedVariables for Flightmaster and TaxiData collection. * Updated Libraries to fix flightmaster data issue. * Removed code that changes Automatic Quest Tracking setting. * Optimized Map Preview to prevent "script ran too long" errors. * Optimized Taxi System to be more accurate. * Fixed auto quest accept error. * Fixed WatchFrame moving bug while tracking Achievement. * WatchFrame modifications are now disabled if Tukui, ShestakUI, nUI is loaded. * Fixed find nearest error for Wandering Isle zone. * Fixed Auto quest accept bug for the new pandaria zones. * Updated Flightmaster WorldMapTracking to be more accurate. * Fixed QuestPOI issues again. * Fixed missing Auto Sell module. * Objective Tracker button no longer open the World Map. * Fixed Taxi system issues. * Fixed several "Interface action failed because of an addon" issues. * Fixed Find Nearest not finding the nearest NPC. * Small fix for World Map Tracking feature. * Map Preview will no longer appear when the Merchant, Quest or Gossip panel is open. * Minor aesthetics change to sounds and graphics. * Fixed WatchFrame not staying on the default position. * Map Preview feature now only work when the World Map is in Minimized mode. * Auto quest item loot feature will also loot coins automatically. * Added missing Scryers and Aldor profession NPC to World map tracking with reputation requirements. * Added engineering teleportation item for Taxi System. * New Taxi System for the waypoints see video in description. * Fixed some Map Preview bugs. * New Auto Quest Item Loot feature. * Updated World Map Tracking database, the find nearest feature should work better now. * New World Map Tracking feature - Option is available in Settings > Maps category. Add icons in the world map when you use your minimap tracking. * New Find Nearest feature - Accessible from the Minimap tracking button to find the closest NPC from your current position. * Added new features Watch Frame Border and Quest Complete Sound. * Fixed Map Preview to work properly. * Fixed Corpse arrow LUA error. * Fixed Carbonite & TomTom compatibility issue. I need help. My waypoint arrow is stuck in the top right corner behind the minimap. I can't move it back to the center. I have unloaded, deleted and updated to 5.010 and it's still stuck in the corner. Can someone please help me get it moved? I like the Gear Manager but I wish it would read data from Pawn so I don't have to manually enter new scales for both addons every time I use SimulationCraft. Re: Hover over mob option? Is there anyway to get an option with this addon where you can hover over mobs to see if you need them for a quest? I love your addon but it competes with another I have that does that, I'd rather use yours but....without that hover over option it just is not the same. Just wondering! Thank you. (*temporary) = "DugisGuideViewerZ\arrow.lua:719: attempt to call method 'AddMFWaypoint' (a nil value)"
any way to scale the tracker to make it bigger? no sorry, we get a lot of taint issue when we do that. Is there anywhere in Dugi Essentials that actually has a quest count (eg. 14/25)? Can this be used with a custom UI like Elvui? Yes, I use it and I do not have any issues. I got a strange error while doing the quest "dirty rats"
the quest location function seems to be off by quite a lot, it says that a quest location should be in one spot, but instead its between 3 - 10 spaces away. Are you using the addon with Guides? if you are then the high memory usage is normal and necessary, shouldn't slow down your pc .